Recently I had several Home Improvement and upgrades to complete. These included the replacement of a furnace and a hot water heater. Additionally I wanted to install a ductless air conditioner. Given that the government currently has several incentive programs in place I thought I would take advantage of those. As usual I called around and got three coats for the work I needed completed. Premier Comfort was by far the most competitive of all the quotes I got. The first installation that I had completed was my ductless air conditioner. The work looked perfect. Martin showed up to do the final inspection and present me with the bill. I gladly paid this bill but was extremely surprised to find out that Martin had given me an additional discount of $300. He said that he was able to save me some money on the installation. Who gives you money back these days, Premier Comfort did. The installation of my furnace and tankless water heater went off as smoothly. I have been using these pieces of equipment for the last several months and am very happy with their performance. Yesterday I called into Premier to let them know I had an issue with the tankless heater. That was at 2 p.m. and by 6:30 p.m. Martin was on my front door addressing my concerns. Once again, where do you get service like that. I would totally recommend Premier Comfort for your next installation job. Thanks for the review Norman, yes we always strive to be a diligent and quick as possible as well as take pride in our work. We'll always be competitive in pricing and deserve to be paid an appropriate amount for our work and product but I sincerely thank you for leaving a review. To take a page out of your-own text: Who Does That!? (leave a review I mean) YOU do & did - that goes such a long way for us, very much appreciated and we'll continue to do this for all and every customer. 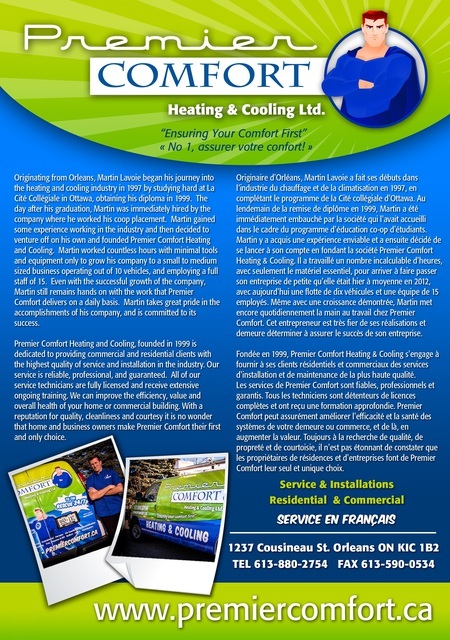 Our air conditioner was not working fully, we were looking for an HVAC company in Orleans and this one was rated very high so I did not hesitate to call them. Martin was able to come same day, he was nice, clean and courteous. He was able to find and fix the problem fairly quickly but then he went on to trying to optimize the function of the unit without asking if that was okay. He spent lots of time researching which meant what should have been a very quick job ended up taking 2.5 hours. He fixed the original problem in the first hour, then went on to do other work that was not authorized. He ended up billing us for only 2 hours, he did give us the first 1/2 hour free. In the end Martin is a very good technician who did go above and beyond to try and optimize our unit, but we do wish he would have asked for permission first before doing the extra work. Just wanted to acknowledge your review and note that we have contacted you this morning to try to resolve the issues you may have perceived within our last visit to you. Glad to hear the actual problem with the cooling system is resolved and now we have made contact with you via telephone and seem to have resolve the 2nd half of any mis-construations that may have arisen. Thank you for taking your time to indicate to us some areas where we may brush-up on moving forward and all constructive criticism will only enrich our and your experience. Have a great day and I'll thank you to update your review to show perhaps a better score as that seems like a fair balance. We were having issues with our AC, Martin was the technicien for the service call. Martin was very professional and friendly, had knowledge and was courteous. He took the time to explain the process with was very helpful. We has a pleasurable experience with Premier Comfort and Martin was exceptionnel. I would highly recommend them to others. I'd just like to take a moment to appreciate your kind review. We appreciate that YOU appreciate the time we take (when possible) to communicate with our customers based on needs or questions you may have. Thanks for honest opinion - that matters to us! After posting my first review below, i was contacted by Martin, the company owner who came today and redid the maintenance. he arrived on time at 10:00 am and finished at 12:30. Now that i had the maintenance i paid for, i'm satisfied with Premier comfort service. this is why i'm posting this update. The technician finished the job in less than 5 minutes and waited in his van for half an hour. he didn't even touch the furnace, the air conditioning. i had tapes on the furnace which he didn't even remove and i can see the dust as is. i would have seen his fingerprints or any sign. after 30 minutes, he told me everything is working fine even though when i first called to book an appointment, i asked to change rubber rings or plastic tubes as it has been 10 years since my first maintenance. when i called this morning, the receptionist was so defensive and didn't accept any discussion. i asked to talk to the owner. i'm still waiting for his call (which i doubt). i wasted $268.94 and NOTHING was done. I'd just like to take the time to respond and thank you for affording us the opportunity to make-up for any objections you initially did have with our original visit to you. Through our telephone conversation & follow-up to make-right by our customers such as yourself, it was and remains a sense of accomplishment to have shown you that we are loyal, honest and professional. That is to say if we'd made any error it was purely un-intentional and hopefully you've seen through our action that we aim to please. All it takes is communication both ways and both parties can and always fruitful. Very satisfied with both the products and service provided by this company and would not hesitate to recommend them. Provided a detailed estimate for all work and products and scheduled the installations within a short period on the date promised. Installers were knowledgeable experienced taking the time to explain the proper operation of the equipment . All work areas were well cleaned up. Hi Clyde, Thank you for taking the time to help our company better serve the Ottawa area by providing a review on Homestars about your experience with us. We appreciate your time and trust. Trusting your home is nice and toasty warm for the rest of the winter. Have a great day! Roxane Monette, Admin Assistant. I guess when you order a simple dryer installation and not a major furnace or air-conditioner job, you are likely to end up with the least-experienced technician. Philosophically-speaking, everybody has to learn sometime. After seeing the predominantly glowing reviews (and one bad one) in Homestars, I decided to try Premier, as recommended by my usual repair company which doesn't do gas. I was happy that they offered to come the same day. After an hour and a half, including a trip to the shop for an adapter, the tech presented the bill, which was greater than expected - although I know I should have anticipated that is always a possibility. Then he noted that he had not hooked up the intake hoses for the steam feature. Instead, he offered to tell me how to do it. I was not pleased and asked him to complete the hookup (at an additional cost he estimated at about fifty dollars). I immediately reconsidered, saying I would complete the job myself, at which point he said he would do it without further charge. After the correction of a small mixup between the hot and cold supply the job was virtually complete. (With this process, the unnecessary disconnection of the washer's hot input hose revealed a seized end fitting, making re-installation difficult. I purchased a new and better one later that evening to return the washer to duty.) I was a grumpy old customer while the tech was here, but was pleased when the job was finally done and I appreciated the fact that the fellow stayed to complete the job without further expense. It was not a smooth ride but I think he sincerely wanted to leave me a satisfied customer. I had Premier Comfort install a new central Air Conditioner on my house. They offered me a fair price and provided a quality service. There was an unexpected situation in which another contractor or installer would have likely postponed the appointment to another day, but upon my request Martin and his colleagues worked up until late evening and managed to get the job done and installed the AC the same day as promised. This alone meant a lot to me and I was impressed by their professionalism and work ethics. I would absolutely use their service again and would recommend them to my friends, colleagues, and family who are looking for a professional, reliable, and quality home service expert! Replaced AC, furnace and purchased new gas fireplace. Martin, the owner, spent a good amount of time explaining all options and prices. Martin and all the staff are very friendly, professional and knowledgeable. Excellent prices and after sales service. I was having major issues with uneven heat distribution, which was causing me discomfort in certain parts of my home. Martin from Premier Comfort visited my home and assessed my heating and cooling systems and provided me with the best solutions for my concerns. I chose the American Standard brand based on quality of product and client reviews. The technicians arrived on the date and time promised, they were clean and courteous, they removed my old equipment without damaging my walls and they installed my brand new furnace and air conditioning systems using above average attention to details. I felt the difference right away with the heating and cooling distribution that is much more evenly dispersed in my home. The representatives and crew of Premier Comfort were professional and clean throughout my entire installation. I recommend them to my friends and family and to you as well. Thank you Larry and Martin, as well as the crew members Marc, Stephane, Dave and Jacob for making me enjoy the comfort of my home. We would like to thank you for taking the time to submit a review for our company. We are happy that you have had a pleasurable experience with us. It is important to us that our clients receive the comfort level they deserve in their home. We take pride in the results we were able to provide for you. Thank you for being a good host to our crew. We required replacement of 2 electric furnaces and heat pumps with 2 gas furnaces and air conditioners. After obtaining 4 quotations we were most comfortable and confident that Premier Comfort could and would do the best job for us. Their price was competitive and the American Standard product responded to all of our needs. The work started and ended on schedule and throughout the workers were careful and mindful of our property. We were very pleased with the professionalism during all phases of the work. We are now enjoying perfectly controlled and distributed air flow throughout our home and wish to thank Martin L. and his crew on a job well done. Thank you for taking the time to submit a review on our company. We pride ourselves with maintaining professionalism and a clean environment for each project we execute. We are pleased that you observed this and your testimonial is greatly appreciated. Thanks again and we look forward to helping you in the future with any additional HVAC needs you might encounter. Our History in Ottawa. 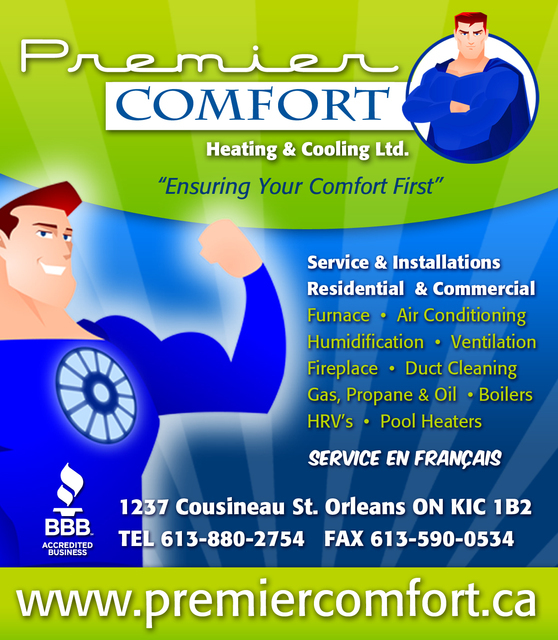 Premier Comfort was started in 1999 with a focus on personalized customer service and consistent results. Our licensed technicians are skilled, courteous, careful and very respectful of clients’ homes and wishes at all times. All of our service technicians are fully licensed and receive extensive ongoing training on a regular basis. Call us today to learn more and schedule your in-home consultation. Keep your home as warm and cozy as you need it with efficient gas furnaces and oil furnaces from American Standard. Premier Comfort provides installation, maintenance and service for the following: furnace, air conditioner, humidifier, ventilation system, fireplace, duct work and cleaning, boiler systems, HRV systems, pool heaters and more. We service commercial and residential clients throughout the greater Ottawa area. We are certified in installing and servicing the following powered equipment: gas, propane and oil. Give us a call today to schedule your in-home consultation. Premier Comfort uses only the best products, that's why we use American Standard.